The Religion in North Carolina Digital Collection is a grant-funded project to provide digital access to publications of and about religious bodies in North Carolina. Partner institutions at Duke, UNC, and Wake Forest University, contributed the largest portion of the items in this collection, but the collection is enriched by unique materials from libraries and archives throughout North Carolina. 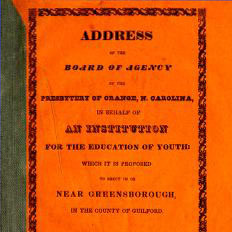 The materials in this collection include local church histories, periodicals, clergy biographies, cookbooks, event programs, directories, and much more.This grant is made possible by funding from the federal Institute of Museum and Library Services (IMLS) under the provisions of the Library Services and Technology Act as administered by the State Library of North Carolina, a division of the Department of Cultural Resources.